If you look in the mirror and all you see is a loser looking back, then take heart. You are in good company. 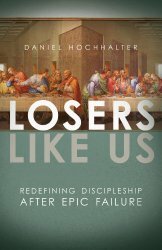 Losers Like Us: Redefining Discipleship After Epic Failure intertwines Dan’s own story of loss and brokenness with that of Jesus’ twelve disciples to show how our “loser” traits, like theirs, are the very qualifications required to receive God’s love and grace, and to manifest his kingdom on earth. Jesus doesn’t just accept losers. He uses them for his work. See my Resources page for more! I have just started reading this book. I have shared about it with two people and one is ordering it. I am excited about what is ahead. Our book group is beginning this on the 10th. We’re excited! That is really awesome! Thank you so much for letting me know. Please do me a favor, and let me know how it going. I would love hearing updates. I really quite enjoyed this book. I think by far the best chapter of the book is the last. But you will have to read the rest of the Book to truly appreciate it. There’s no platitudes here. Hochhalter is honest and surprisingly open and honest to a fault. He lost his pursuit in a final interview to get a P.H.D. And what does he do now? After years of teaching, studying and giving his all to get it-only to be denied it by two people in a final interview? Well, you’d have to read the book to appreciate the irony. I learned much about discipleship in this book. Discipleship means being a follower. So, high or low, educated or not, there is one we all follow- Jesus Christ. The author makes this point poignantly, sweetly, honestly and in all sincerity. And that makes him a “winner” in my Book.